Your guide will introduce you to the prettiest Galleries and Covered Passages of the capital usually familiar only to Parisians. Strolling down the streets, you will go back in time and will relive history. Feel like a Parisian and explore these unique shopping arcades including the elegant Galerie Vivienne and the very fashionable Galerie Véro-Dodat. After meeting your guide near the Palais Royal, you will be given a complete introduction of the covered passages. During a period of only sixty years or so, between the late 18th century and the mid of the 19th century in Paris, the areas around today’s Grands Boulevards created many glass-roofed shopping galleries known as les passages couverts or covered passages. 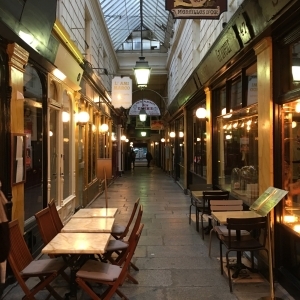 By the 1850s there were approximately 150 covered passages in Paris but this decreased greatly as a result of Haussmann‘s renovation of Paris. Today, 18 passages remain, all on the right bank. Each passage has its own special character but they have one thing in common: they are all private roads, some open to pedestrians, some not, and are all run by private owners. Their entrances are easy to miss and where you emerge at the other end can be quite a surprise. After this complete introduction, you will follow your guide inside the inner courtyard of the Palace where you will discover the controversial art installation, the Buren Columns. 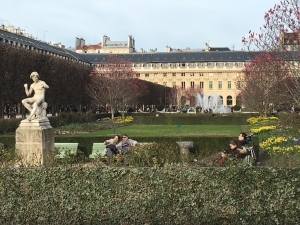 The Palais-Royal has a rich history of its own. For four centuries it has been a seat of power and place of pleasure, a real village in the heart of the city. Before becoming a royal palace, it was the residence of Cardinal Richelieu in 1633, Louis XIII’s famous advisor. The Palais-Royal subsequently became a royal possession under Louis XIV, and then was the home of the Dukes of Orléans. Then,you will stroll through the prestigious and peaceful gardens of the Palace and you will admire its breathtaking architecture. From the Palais Royal, your guide will take you along to Galerie Véro-Dodat to discover a real architectural gem. 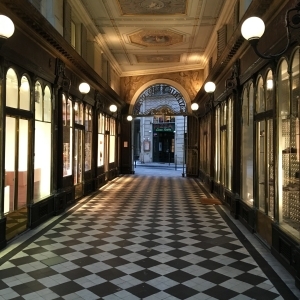 Built between the Palais Royal and les Halles in 1826 in a neoclassical style with marble columns, frescoes, and a black and white tiled floor, the Galerie Véro-Dodat was one of the first of Paris’s passageways to get gas lighting in 1830, and one of the last to fall into decline. A real haven of peace, full of parisian charm, the Galerie Véro-Dodat has a few surprises in store for its clients. Nowadays the gallery is real perfect for hours of delicious browsing. It houses many elegant shops specializing in antiques, objets d’art, art books,musical instruments and fashion accessories. You will learn about the history of its famous boutiques before reaching the majestic Galerie Vivienne. It is now time to visit the exclusive Galerie Vivienne renowned for its exquisite setting and beautiful decor. 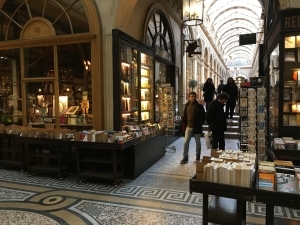 In a peaceful location, behind the Bibliothèque Richelieu and near the Palais-Royal, the Galerie Vivienne is one of the most iconic covered arcades in Paris. The architect Francois-Jacques Delannoy built in 1823 the most elegant and sophisticated shopping gallery of Paris with architecture worthy of the greatest palaces. You will be amazed with the gallery’s lavish Pompeian style decoration with its ochre paintwork and mythology-themed colorful mosaics on the ground. Even during busy times it has an air of quiet elegance, making it a pure pleasure to browse the chic boutiques. Your guide will show you where to look to discover curiosities and small details that others miss. If you love old books and fine wines by the glass, you’ll enjoy spend some time there !!! Explore the best of the passages with the most iconic covered arcades in Paris : the Passage des Panoramas built in 1799. It’s definitely worth a visit ! It takes the credit for being the oldest of the covered passages and the first public area in Paris to be lit by gas in 1817. From the Bourse district to the Grands Boulevards, sheltered by a magnificent canopy, the commercial artery is listed as historical monument. Follow your guide and visit small and delicious shops while walking through the most characterful of Paris’s covered galleries, crammed with quality bars and restaurants, vintage postcard shops and philatelist boutiques. Each store window reflects an historical moment of the French capital. The arcade still houses the famous engraver Stern, founded in 1840. Tour ends on the Grands Boulevards.